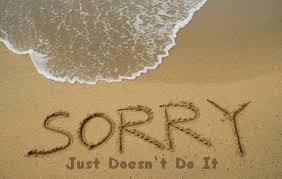 Today is Yom Kippur, the Jewish Day of Atonement, and it seems to me a good day to talk about making amends. The idea of making amends confused me in the early days of my sobriety. I knew I was supposed to do it, but I really had no idea of what to do or how to go about it. I equated it with saying “I’m sorry.” I was well-practiced at that, as most addicts are, but somehow it didn’t seem like enough. That was how I went about it, though, and pretty quickly. I suppose I had a sponsor, but I wasn’t big on taking advantage of sponsorship (or taking direction), and I saw recovery as more or less an event, rather than a process. Thus I was gung ho, ready to go — and far from being in the know. This entry was posted in addiction and tagged 9th Step, amends, Forgiveness on September 23, 2015 by Bill. Why Not Bend…Just A Little? Tomorrow is Easter, and the third day of Passover. Many of us will be visiting with relatives, or we may be living at home. There will probably be some pressure to attend church, or temple during the coming week, and many of us have developed aversions to the religious practices of our families, for a variety of reasons that aren’t worth delving into here. 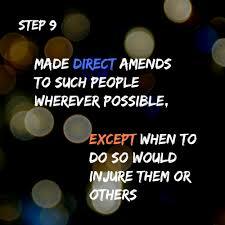 However, those of us who are involved in 12-step programs are in the process of making, or preparing to make, amends. Even though we may have our reservations, wouldn’t it be a wonderful surprise for our families if we tried to participate in the celebrations? It wouldn’t cost us anything, really. Our “principles” were formed in our addictions, and such an endeavor will give us a chance to reevaluate them in the light of sobriety and clear thinking. We can tighten it up and “act as if” for a couple of hours. And it would mean so much to them. This entry was posted in 12-Step Programs, addiction, alcoholism, family, living, Spirituality and tagged amends, Easter, humility, Passover, religion on April 4, 2015 by Bill. This entry was posted in 12-Step Programs, addiction, alcoholism, family, recovery and tagged 9th Step, amends, sponsor on November 3, 2014 by Bill. This entry was posted in 12-Step Programs, addiction, alcoholism, denial, recovery and tagged 4th Step, 5th Step, 9th Step, amends, spiritual maturity on October 27, 2014 by Bill. This entry was posted in addiction, alcoholism, recovery and tagged amends, apologies, how to apologize on December 16, 2008 by Bill.